Referred to in the Industry as the Blue Book! #1 Best-Selling Book on Dealer Coin Prices! H 7 5/8" x W 5 1/4"
Sorry, Hard Cover Not in stock as yet. 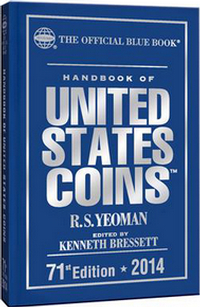 "Since 1942, coin dealers have used the annual Handbook of United States Coins—the OFFICIAL BLUE BOOK®—to make buying offers. You can use it to find out how much your coins are worth! The Blue Book’s price listings offer a real-world look at the coin market, gathered from dealers around the country. The 73rd edition has been expanded, with eight additional pages of content including updated prices and many new photographs. New sections include a glossary of coin-collecting terms, a bibliography for further research, an appendix on selling coin-like tokens and medals, a chart of the top 25 coin prices realized at auction, and an illustrated essay on how to grade coins, and how grade affects value. 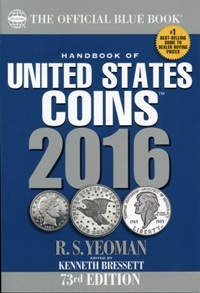 The Blue Book covers colonial and early American coins, federal coins (half cents through gold double eagles), commemoratives, Proof sets, die varieties, private and territorial gold, Civil War tokens, the newest Presidential dollars, National Park quarters, bullion coins, and many other American coinage series. More than 24,000 prices in multiple grades. Easy-to-follow coin-grading instructions. Coins and tokens from the 1600s to today. Historical information. Hundreds of detailed, actual-size photos. How to start a coin collection. Detailed mintage records, and much more. The 73rd edition is expanded to 288 pages (16 pages more than the 72nd edition); available in classic silver-titled blue hardcover (library quality) or convenient softcover (for day-to-day use)."